Preheat oven to 350. Butter two 8-inch round cake pans, line the bottom of each pan with a piece of parchment paper (cut to fit the pan), then butter the parchment. Lightly dust the pans with flour, shaking off the excess. Chop the chocolate and combine with the cocoa powder in a small bowl. Add the boiling water and whisk until the chocolate is melted and smooth. Set aside. Pour the batter into the prepared pans and bake for 35 to 40 minutes, or until a toothpick inserted into the center comes out clean. Cool cakes in the pans on a rack for 30 minutes, and then invert them onto the cooling rack to cool completely. After reading several recipes, I got the sense that the temperature of the butter was key to the frosting coming together correctly. Epicurious.com said that the butter should be soft on the outside but still cold in the center. Another said it should be like ice cream: Soft enough to scoop but will still hold it’s shape. So, I stacked all the cubes in the microwave and cooked for 20 – 30 seconds (but checked them every 10 seconds). This resulted in a semi-soft yet still cool in the center cube. In a glass dish placed over a pan of simmering water, lightly whisk the egg whites and sugar together until the sugar is completely dissolved and the mixture reaches 160 degrees. Pour the egg white mixture into the bowl of a standing mixture (the bowl should be room temperature). 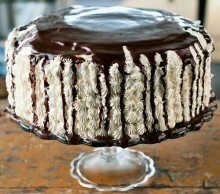 Using the wire whisk attachment, whip the mixture on medium-high speed until white and double in volume. Stiff peaks should form and the mixture should not move around the bowl when the mixer stops. While the egg whites are whisking, cut the butter into slices (about 8 per cube). Swap the whisk attachment for the paddle attachment. Add half the butter (3 cubes) to the egg whites placing them evenly around the surface. Pulsate the mixer (by quickly turning it on and off), which will force the butter on the top to the bottom. Add the remaining butter and repeat the pulsating until no clumps of butter are on top. Starting the mixer on low, slowly increase the speed every 10 seconds until you reach medium-high speed. Continue beating until the mixture begins to be light and fluffy. Stop the mixer scrape the bowl. Add the vanilla and beat on low speed for 45 seconds and then increase to medium-high and beat for an additional 45 – 60 seconds or until the frosting is completely smooth. Frost the cake, using 1/3 between the layers, 1/3 on top and 1/3 for the sides. Refrigerate for about an hour before glazing. Chop the chocolate and place it and the cream in a pyrex mixing cup (with a pour spout). Microwave for about 1 minute until the chocolate begins to melt and and the cream begins to steam. Slowly drizzle over the cake letting it run down the sides. Note: Total time includes two hours for cooling and refrigeration.